25 Reasons You Might Just Be a Blue Grouse Hippie. YOU MAY BE A BLUE GROUSE HIPPIE IF . . .
1. You see every summer fishing expedition to a high mountain stream or lake as having the dual purpose of scouting for blue grouse. 2. You have ever longed to be on a windswept alpine ridge in the dead of winter following your dogs and looking for the birds of a dusky feather. 3. You are amazed every single time you connect with a bird as it dives downhill. 4. You realize that the bird’s official name is now the “Dusky Grouse,” but you have been calling them “blue grouse” for so many years that you refuse to make the switch. 5. You are not really keen on exercise, but you would hike Everest for a chance at a blue grouse and never think twice about it. Tommy Boy is pooped after climbing up a steep, thick spot looking for blue grouse. 6. 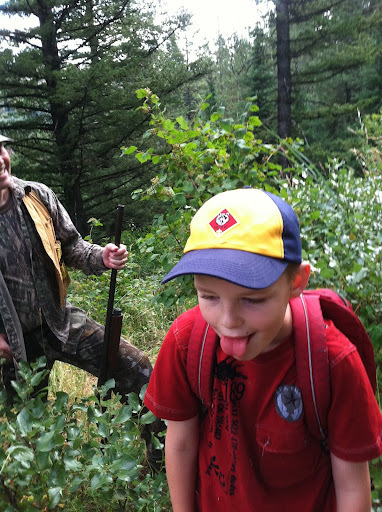 You take your wife, kids and dogs huckleberry picking in hopes of finding another covert loaded with blues. 7. You always hope to find the mythical bottleneck where the blue grouse congregate in astounding numbers on their annual upward migration to higher elevations. 8. You seek out every mountain ash berry tree with its bright orange fruit and pitch rocks into it in hopes of flushing a grouse―and sometimes it works. 9. You refuse to pot a bird on the ground or in a tree, but you will pitch sticks and rocks for the always difficult second flush (of course, you know it gets even trickier when you are the thrower and the gunner!). 10. You have accidentally killed a blue with a rock or a stick when trying to cause the second flush. 11. On occasion, you’ve gone 3 birds for 3 shots, but on others you have gone 0 for 8, or worse, and loved every second of it! 12. You have ever been startled by the flush of a blue, but instinctively shot from the hip just before the blue reached cover and surprisingly thumped it. 13. You have hunted mountains so steep with timber and downed trees so thick, tangled and gnarly, you think: Chukar hunters are wussies. 14. Even though blues are categorized as “forest grouse,” you know from experience that they can be found in the wide-open sagebrush, bitter brush, and other berry bushes and always hope to find them there when stepping out of the timber. 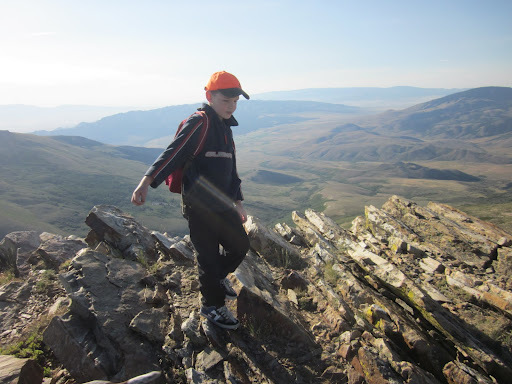 Future Blue Grouse Hippie, Thomas, enjoys the view from 10,000 feet, where I’ve seen grouse base jump . . . Kamikaze style. 15. You have ever wished that you had two vehicles on a hunt so that you could park up at the top of the ridge and work your way down to the other truck because you know that, what goes down must come back up. 16. At the thunder of a blue’s flush, you have whiffed some of the easiest shots imaginable, but you have made others that were downright impossible. You realize that every shot made on a blue is a lucky shot and you genuinely wish every bird you miss well as he makes his escape. 17. 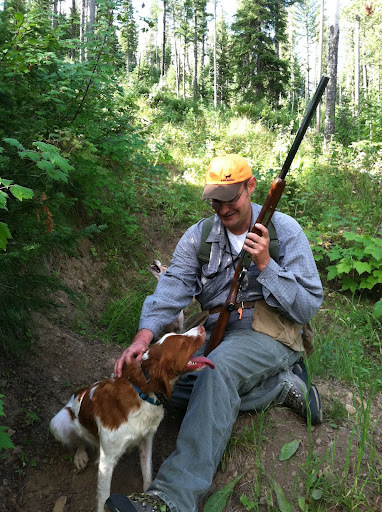 You love blue grouse as much as (or more than) your crazy bird dogs. 18. You have stood on the edge of a 1000 foot drop that a blue grouse just kamikazied off with the sunrise in the background and you think: This bird and this country never cease to amaze me! 19. You have hunted the same spot at the same time year after year and sometimes the birds are present in great numbers and sometimes you cannot find so much as a feather and you are mystified and intrigued by their absence. 20. At the end of the season you have black and blue― or even missing― toenails despite good boots due to hiking in rugged terrain. 21. You have ever fallen and scuffed your gun, dinged your barrel, ripped your pants, bruised your knee, shin or buttocks, or hurt your back while pursuing a blue. 22. You have ever buried your bird dog in the specific location where she found, pointed and retrieved numerous blues one glorious morning. 23. You have ever been in church on Sunday thinking about blue grouse when you should have been thinking about God. 24. 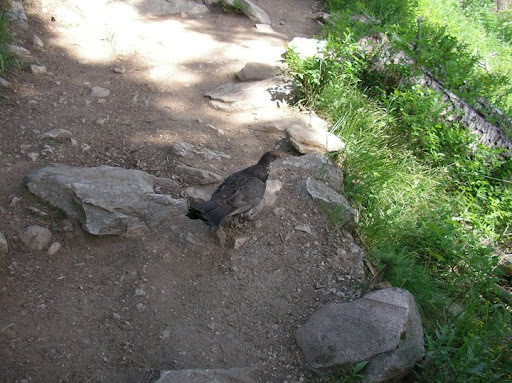 You have ever been on top of a mountain thinking about God when you should have been thinking about blue grouse. 25. You compare every game bird and its habitat to the blue grouse and, in your book, every other bird and its environs play second fiddle, even the blue’s awesome lowlander cousin, the ruffed grouse. The bird of a dusky feather. Great post, I wish I could just find on once! Its good to know someone has a plan that works! Thanks turn me loose. They are sure a fun bird to hunt. Good luck in your efforts to find them. Let me know if you make it to Idaho and I can give you some tips. They are a grand game bird! It doesn’t get any better than blue grouse hunting in September.